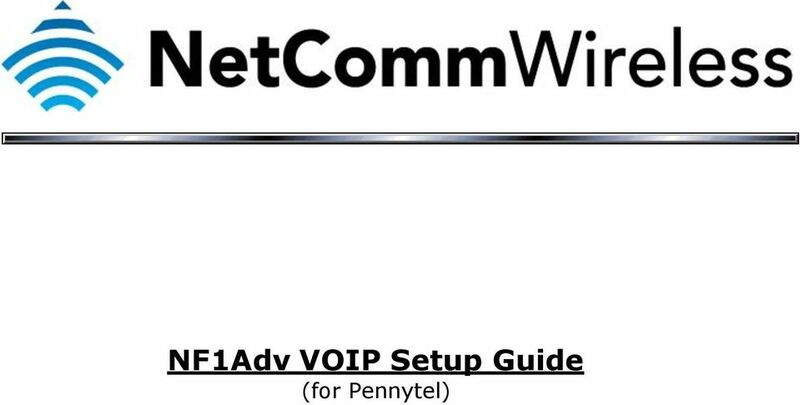 Download "NF1Adv VOIP Setup Guide (for Pennytel)"
2 Configuring your NF1Adv for VOIP Service The following steps will take you through the process of setting up your VOIP connection. 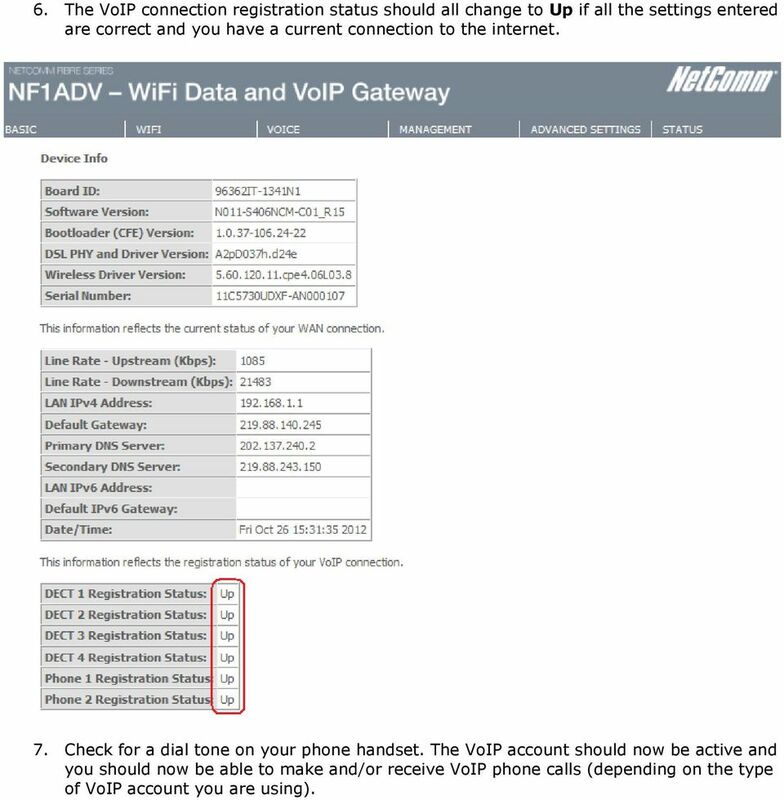 Step 1: Checking Computer Network Settings: You will need to connect your computer directly to your VOIP device (modem, or ATA) and set the network connection on your computer to obtain an IP address automatically. Please follow the instructions appropriate for your operating system below: Below are the instructions for setting Windows XP to obtain an IP address automatically for your ethernet connection: 1. Click on the Start Menu, and go to Control Panel. 2. Click on Network Connections. (If you only see "Network and Internet Connections", open that first, and then click on "Network Connections") 3. Right click on Local Area Connection and select Properties. 4. Double-click on Internet Protocol. 5. Select "Obtain an IP address automatically", and "Obtain DNS server address automatically". 6. Click OK, and then click OK (or Close ). 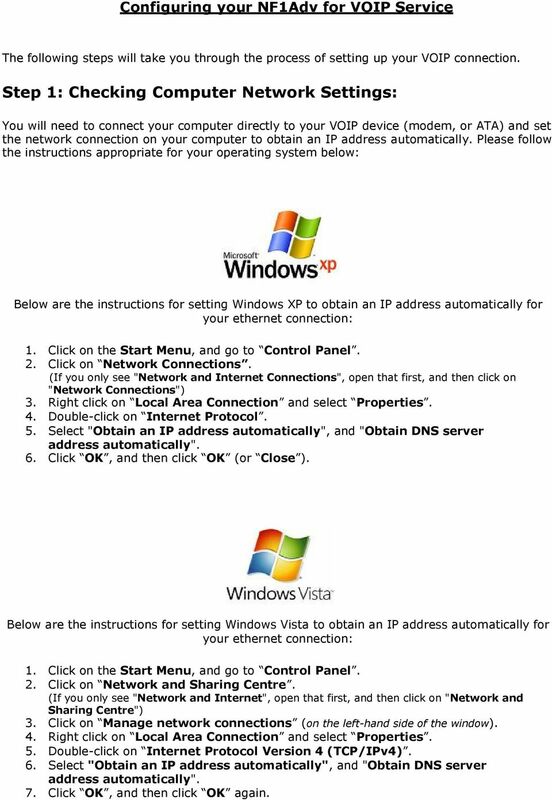 Below are the instructions for setting Windows Vista to obtain an IP address automatically for your ethernet connection: 1. Click on the Start Menu, and go to Control Panel. 2. Click on Network and Sharing Centre. (If you only see "Network and Internet", open that first, and then click on "Network and Sharing Centre") 3. Click on Manage network connections (on the left-hand side of the window). 4. Right click on Local Area Connection and select Properties. 5. Double-click on Internet Protocol Version 4 (TCP/IPv4). 6. Select "Obtain an IP address automatically", and "Obtain DNS server address automatically". 7. Click OK, and then click OK again. 3 Below are the instructions for setting Windows 7 to obtain an IP address automatically for your ethernet connection: 1. Click on the Start Menu, and go to Control Panel. 2. Click on Network and Sharing Centre. (If you only see "Network and Internet", open that first, and then click on "Network and Sharing Centre") 3. Click on Change adapter settings (on the left-hand side of the window). 4. Right click on Local Area Connection and select Properties. 5. Double-click on Internet Protocol Version 4 (TCP/IPv4). 6. Select "Obtain an IP address automatically", and "Obtain DNS server address automatically". 7. Click OK, and then click OK again. 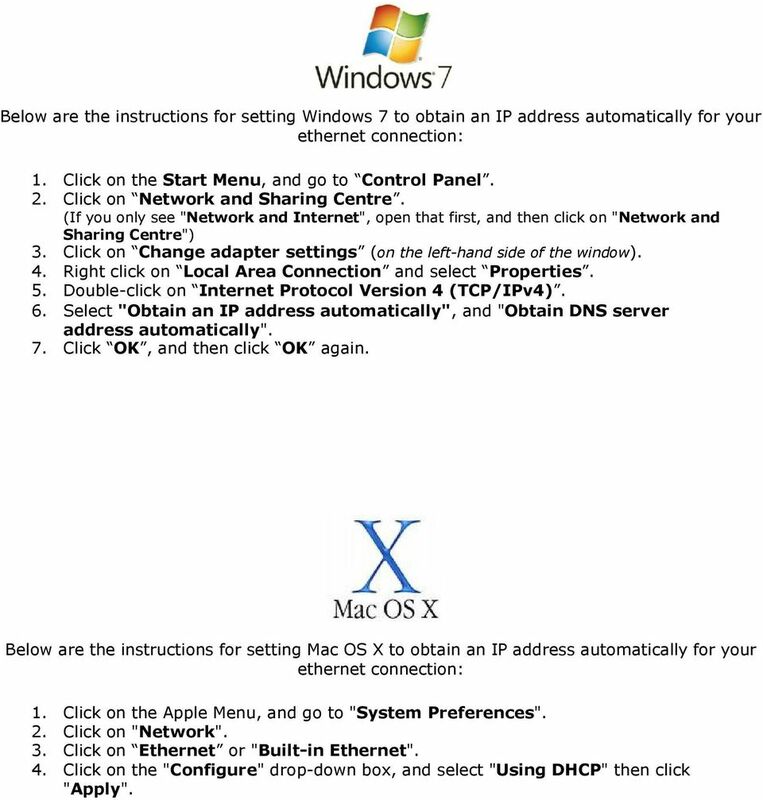 Below are the instructions for setting Mac OS X to obtain an IP address automatically for your ethernet connection: 1. Click on the Apple Menu, and go to "System Preferences". 2. Click on "Network". 3. Click on Ethernet or "Built-in Ethernet". 4. 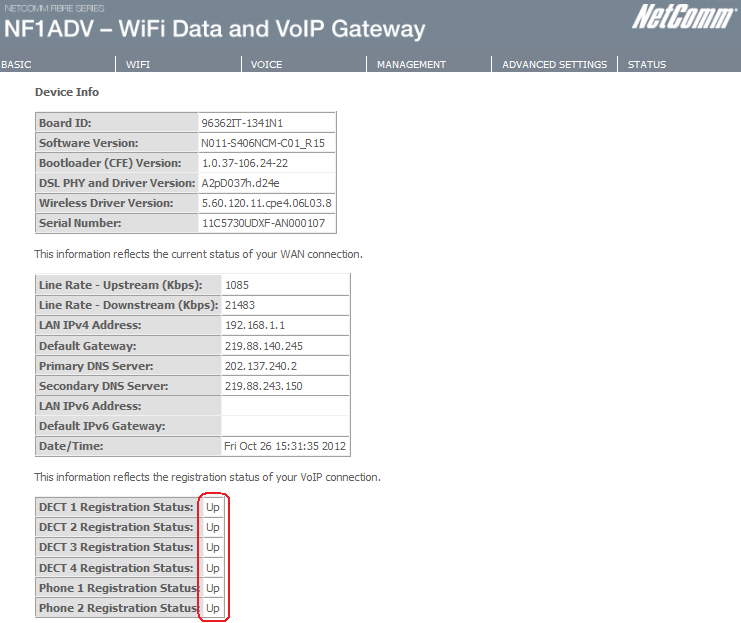 Click on the "Configure" drop-down box, and select "Using DHCP" then click "Apply". 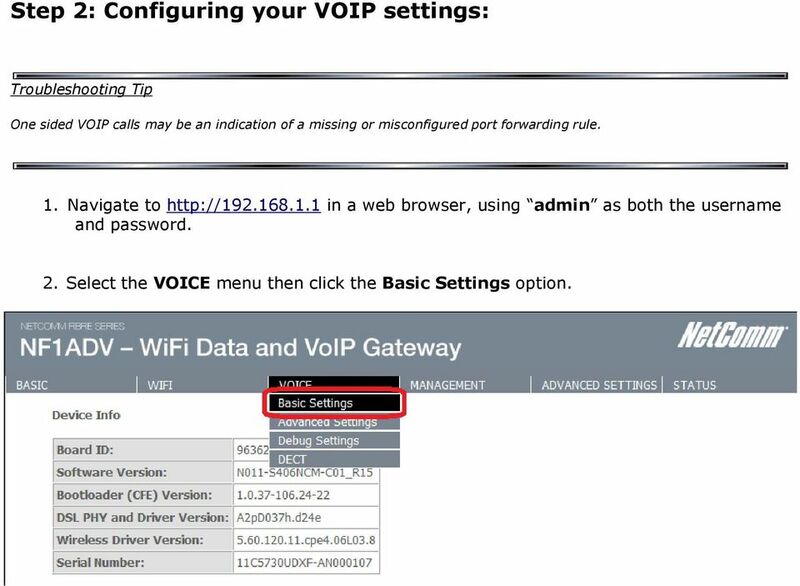 4 Step 2: Configuring your VOIP settings: Troubleshooting Tip One sided VOIP calls may be an indication of a missing or misconfigured port forwarding rule. 1. Navigate to in a web browser, using admin as both the username and password. 2. Select the VOICE menu then click the Basic Settings option. 6 SIP Configuration Locale Selection SIP domain name Use SIP Proxy SIP Proxy SIP Proxy Port Choose your country from the dropdown list Keep blank or as directed by Pennytel sip.pennytel.com or as directed by Pennytel 5060 or as directed by Pennytel Use SIP Outbound Proxy SIP Outbound Proxy SIP Outbound Proxy Port Use SIP Registrar SIP Registrar SIP Registrar Port Account Enabled sip.pennytel.com or as directed by Pennytel 5060 or as directed by Pennytel sip.pennytel.com or as directed by Pennytel 5060 or as directed by Pennytel VoIP Phone Number Display Name Auth. ID Auth. 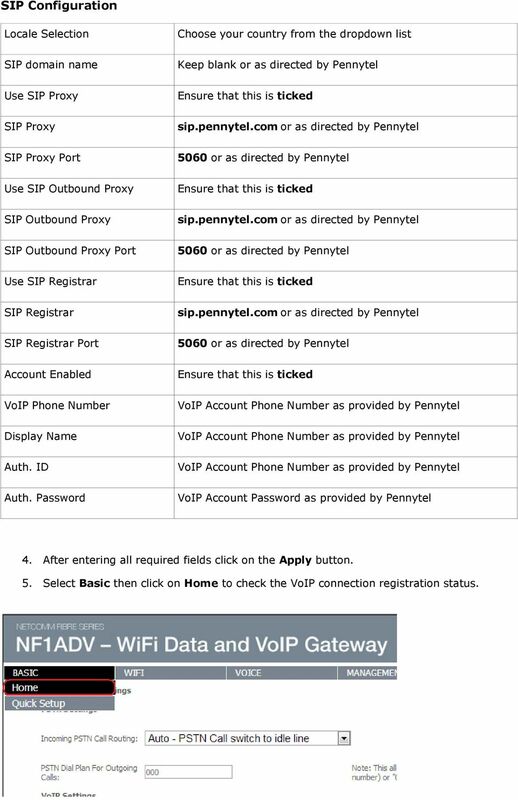 Password VoIP Account Phone Number as provided by Pennytel VoIP Account Phone Number as provided by Pennytel VoIP Account Phone Number as provided by Pennytel VoIP Account Password as provided by Pennytel 4. After entering all required fields click on the Apply button. 5. Select Basic then click on Home to check the VoIP connection registration status. 7 6. The VoIP connection registration status should all change to Up if all the settings entered are correct and you have a current connection to the internet. 7. Check for a dial tone on your phone handset. The VoIP account should now be active and you should now be able to make and/or receive VoIP phone calls (depending on the type of VoIP account you are using). Based on the VoIP Example 1(Basic Configuration and Registration), we will introduce how to dial the VoIP call through an encrypted VPN tunnel. RingCentral Office. Configure Grandstream phones with RingCentral. To contact RingCentral, please visit www.ringcentral.com or call 1-800-574-5290. 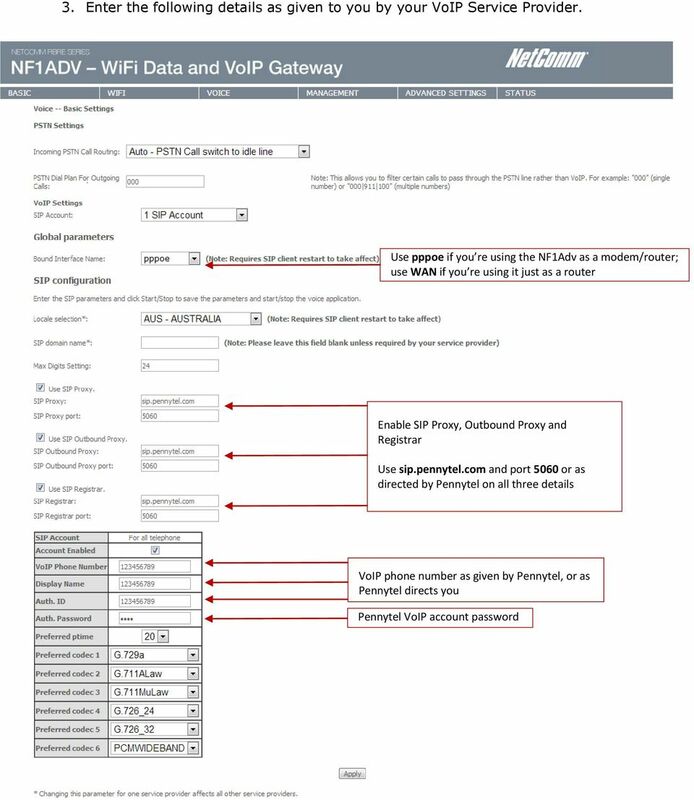 NF4V VDSL/ADSL WiFi Gigabit Modem Router Firmware Release Notes Copyright Copyright 2015 NetComm Wireless Limited. All rights reserved. The information contained herein is proprietary to NetComm Wireless.